Olive Tree Genealogy Blog: What's Your Mix? It occurred to me a few days ago that I don't know my mix. By "mix" I mean the % of my ethnic ancestors I have in my bloodline. I know I have Irish, English, Dutch, American and Canadian but as to percentage of each group, I've never bothered to figure it out. So here goes! I'm only going to go back 5 generations because that way every branch of my ancestors is known to me. I can go back 15-20 generations on some lines but not my Irish McGinnis family. I don't want to assume they are Irish going back from my 2nd great grandfather Joseph McGinnis. So - if I take my lineage back to my 2nd great grandparents, who's in the mix? And where were they born? I'd need to go futrher back to bring in my Dutch, German and Native American ancestors. It looks like I am 53% English, 37% Canadian and 10% Irish. What's your mix? Once you track your ancestor back to Ireland, and he is in Belfast, and his name is Todd - what's the nationality? I picked Scotch! All the French in Quebec, I track as French. And then Leipzig, Germany vs. Vienna Austria? German, Prussian, Saxon, Austrian? Sometimes I just pick! But I made Excel pie charts for my kids for their 4th grade family history project. It was fun! 6.25% Swedish,1.56% Native American Chippewa, 10.94% French, 4.69% Scotch, 26.56% English, 25% German, 25% Austrian. It's an interesting exercise. 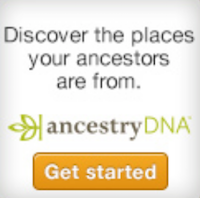 How did it compare with your DNA results? I think it's fascinating what DNA can tell us now about the migrations of man. It certainly gives deeper meaning to what it means to be one ethnic or national identity over another. I did the same thing earlier this year with 7 generations (64 ancestors. All of my great grandparents and 2 time great grandparents that I know about were born in the USA. Not sure about my masternal grandfather's paternal grandfather. I do have a DNA percentage breakdown from 23 and me. How did any of you verify your Native American information? Thank you.